During the summer of 2007, the Manchester Airport advertised a design-build for the runway extension at South Willow Street. The project required the relocation of South Willow Street around the runway toward Cohas Brook. Stormwater quality and quantity control needed to be provided for the relocated road and runway extension. 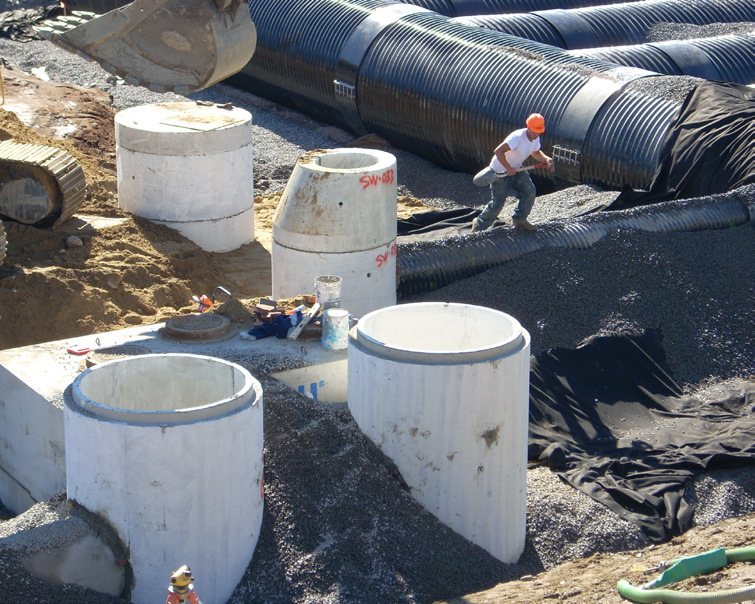 In keeping with FAA’s requirements not to have any ponded water adjacent to a runway, Continental Paving Inc., Fay, Spofford and Thorndike’s and Contech engineered a 96” underground detention system adjacent to the south end of the runway and a 78” diameter system adjacent to the north end along with a Vortechs model 4000 offline to treat stormwater prior to entering each system. The Vortechs system removes finer sediment, particles, free oil and debris from urban runoff. The unique design allows for easy inspection and unobstructed maintenance access. This high-performance system uses an effective combination of swirl-concentrator and flow-control technologies to maximize treatment. Overall, almost 3 acre-feet of underground storage was provided in polymer-coated corrugated steel pipe (TRENCHCOAT) designed for a service life in excess of a 100 years factoring in aircraft deicing chemicals and road deicing agents used on South Willow Street and the runway. Another manufacturer offered a design-supply quote on a 60” diameter HDPE system and the price was about twice as much as the larger diameter CMP system proving that even polymer-coated CSP is significantly more economical than HDPE anywhere large diameters will fit. The break even size for Aluminized Steel versus HDPE is 30” and CSP is less installation sensitive than HDPE.